On the first day of the new year Hazem Abdel Azim, a former official with Abdel Fattah al-Sisi’s presidential campaign, published what he called “a testament to the truth of the president’s parliament.” In it, he offered details that for the first time exposed the role of the General Intelligence Agency in the formation of the pro-Sisi For the Love of Egypt (FLE) electoral list. About a month before, FLE had won all 120 seats designated for lists in the parliamentary elections. Date: Tuesday, February 3, 2015, 7 pm. Place: A conference room inside the Egyptian General Intelligence Agency, ground floor. Purpose of the meeting: To announce a new list to compete in the parliamentary elections. Attendees: At the head of the table, a deputy director from the agency with four intelligence personnel (three of them young men ages 30 to 40). At the other end, a very close legal advisor to the president, whose father is a member of parliament; an aide in the president’s office, the one who invited me to attend, and about 15 public figures, the founders of this list, myself one of them. Those who conducted the meeting were the intelligence director on one side and the legal advisor on the other. Papers were handed out to all the attendees with the name of the list and the statement of principles. For the Love of Egypt … was born in this meeting. Yes, inside the Egyptian General Intelligence Agency. I was there, at the invitation of the presidency. The revelation that the state had a hand in creating this list did not come as a surprise to many. 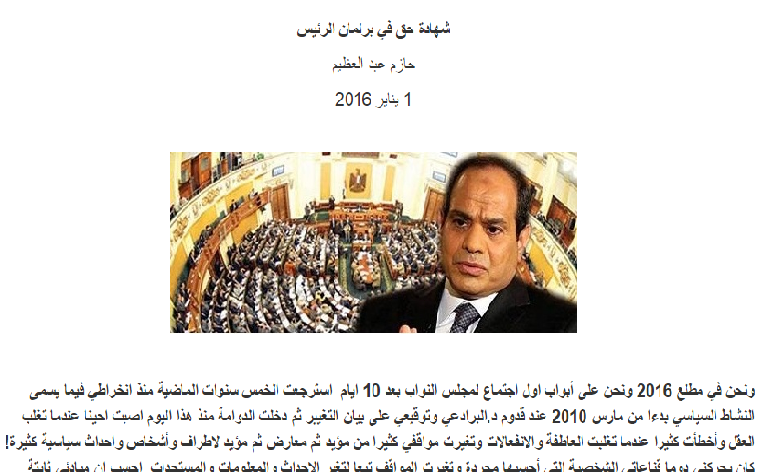 In the months leading up to the elections, the media had hinted and then explicitly accused unnamed “sovereign” state agencies of interfering in politics, and seeking to shape the first parliament in Sisi’s tenure by throwing their weight behind certain candidates. But the bombshell testimony from one of the people involved in the creation of the FLE was the first public confirmation of the direct role played by the president’s office and General Intelligence — a role that went beyond simply backing selected candidates to build a state-sponsored electoral list. After publishing his statement, Abdel Azim declined to be interviewed, but his testimony encouraged others to recount what they had seen in the run-up to the elections in November and December 2015. Mada Masr spoke with some of them over the last few months. Most of them agreed to tell their stories on condition of anonymity. Together, they offer a portrait of the painstaking, sometimes bumpy process of constructing a parliament loyal to the current president. … The state shall guarantee the safety, neutrality, and integrity of referendum and election procedures. 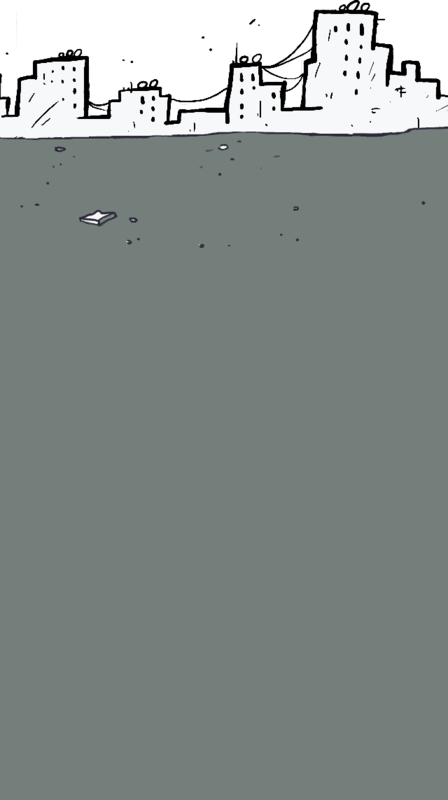 It is prohibited to use public funds, government agencies, and public utilities … for political purposes or electoral campaigning — Article 87, Egyptian Constitution. Mada Masr obtained, from two separate sources, a list of attendees invited to the founding meeting on February 3, 2015 in the General Intelligence headquarters. They are: Sameh Seif al-Yazal, a former intelligence officer who would later become the coordinator of the list; Mahmoud Badr, founder of the Tamarod movement, an initiative launched to oust Mohamed Morsi from the presidency in 2013; Mohamed Badran, chair of the Nation’s Future Party and former head of the Egyptian Student Union; Tarek al-Kholy, a former leader of the April 6 Youth Movement; Gebaly al-Maraghy, the chair of the Egyptian Trade Union Federation; Osama Heikal, former minister of information under the Supreme Council of the Armed Forces; television anchor Osama Kamal; Sayed Mahmoud al-Sherif, the head of the syndicate for the descendants of the Prophet, who would later become a deputy speaker of the House; Emad Gad, a political analyst and former leader of the Egyptian Social Democratic Party and later the Free Egyptians Party, and Taher Abu Zeid, a former minister of sport. There was one woman at the meeting as well: Amina Noseir, a professor of doctrine and philosophy at Al-Azhar University. All the attendees were later given slots on the FLE list and all won seats in the current assembly, with two exceptions. Hazem Abdel Azim later announced his withdrawal from the list, and Osama Kamal ultimately decided to devote himself to his television work, although at the initial meeting he was appointed the official spokesperson for the list. In late February 2015, Kamal launched a new program on Qahera wal Nas called, “Mr. Representative,” introducing voters to parliamentary candidates and their platforms. When some people at the meeting inquired about other candidates on the list, they were told the selection process was still underway. Nevertheless, attendees were informed that a press conference had been called for the following morning to announce the establishment of the list, and they were all advised to attend. The path to the formation of the FLE list was not always smooth. In fact, the list emerged in the wake of several aborted attempts. The first of these was an initiative launched by Amr Moussa, the chair of the constituent assembly that drafted the 2014 Constitution. Some participants in meetings for this list said it wasn’t created or even backed by the government. Instead, it was an attempt by Moussa to create “a parallel [list] that would include everyone, even the National Movement Party led by Ahmed Shafiq, to be a parliamentary bloc that would not oppose the government, but at the same time would not act on its orders,” according to Mohamed Abul Ghar, the head of the Egyptian Social Democratic Party, who took part in some of the meetings for Moussa’s list, dubbed the Egyptian Nation Coalition. But the government was uneasy about such an arrangement. It had tried something similar with the formation of the 50-member constituent assembly, which included individuals who could not be fully controlled and produced constitutional articles that created a headache, even for Sisi himself. (The Constitution was written with “good intentions,” he later said disapprovingly, but “states are not built with good intentions.”) A few months after Moussa began his efforts in July 2014, he declared his failure to reach a consensus “in light of the ongoing party fragmentation.” Before his attempt was pronounced dead in the water, the high priest of the Egyptian state, several-time prime minister Kamal al-Ganzouri, hinted to all political players that he was tasked with forming the state-backed list directly by the presidency and expected to win all 120 of the list seats in the house. It wasn’t hard for Ganzouri to convince parties that he was on an official mission — he had been the president’s advisor since July 2013 and had hosted meetings about the list in his office at the General Authority for Investment, where he would tell attendees that he was forming a list at the behest of and in coordination with Abbas Kamel, the president’s chief of staff. The question of whether Ganzouri’s was a sincere attempt or simply a maneuver designed to suss out the political landscape and divide the competition was moot by February 2015: the president’s office decided to set Ganzouri aside and assume direct responsibility for forming the list, forgoing political intermediaries who were not wholly trustworthy and did not possess the necessary sway to recruit candidates and persuade businessmen to fund the venture. And that’s where the February 3 meeting at General Intelligence headquarters came in. “… The president has stated on more than one occasion that the state takes an impartial stance toward all lists and all candidates, and does not interfere with or back any of them … We thus assure you that the state has remained and will continue to remain at arms length from all. It has not and will not back any lists or persons” — Press Office of the president of the Arab Republic of Egypt, Al-Masry Al-Youm, March 4, 2015. Information obtained by Mada Masr indicates that the presidential aide who invited participants to the meeting of February 3, 2015 was Major Ahmed Shaaban, an officer with Military Intelligence, who played a leading role in tailoring the pro-government coalitions, both for the lists and individual constituencies. Although the public record offers little information about Shaaban, his name is well known in party and media circles as the liaison to the presidency, especially to Kamel, one of Sisi’s closest confidantes. Shaaban previously worked as the director of the office of Armed Forces’ spokesperson, Ahmed Ali. As soon as Sisi was elected president in July 2014, he was seconded from the Defense Ministry to the president’s office, along with Kamel and Ali. The latter soon disappeared from the scene, leaving Shaaban as the number two man at Ettehadiya and the right hand of Kamel. One of the young men at the meeting was Yasser Selim, who introduced himself as a former General Intelligence officer who still worked for the agency in a civilian capacity. Selim would go on to act as the actual coordinator of the FLE list, working behind nominal coordinator Seif al-Yazal. Selim’s name would also gain greater public currency in coming months as a major shaper of Egypt’s media landscape, working for General Intelligence behind a media front company known as Black and White. A few months before the February 3 meeting, in mid-2014, Selim announced that his company had gained exclusive marketing rights to the privately owned Youm7 newspaper and website in Egypt and abroad, in partnership with Promomedia. In late 2015, Selim’s company, Black and White, bought out the website Dotmsr from shareholders. One shareholder, speaking on condition of anonymity, told Mada Masr that the Emirati funders of the site (its actual owners) contacted him and all nominal shareholders and told them to transfer their shares to Selim and his partners. It had been decided “to transfer ownership and management of the website directly to Egyptian General Intelligence in light of the website’s professional and financial difficulties” after the sudden death of its founder, Abdullah Kamal, in mid-2014. The same month, Egyptian Radio and Television Union (ERTU) announced that it had contracted with Black and White for the production of a daily television talk show, “I Am Egypt.” Following first whispers and then open questions about the identity of the producers of the new program, which launched in January of this year, ERTU chief Essam al-Amir was forced to release a statement to the press. “The sponsoring company has no ties to any sovereign bodies,” he said. It is not a surprise that the outcome of the February 3 meeting, the names of some invitees, and even the time and place of the next day’s press conference were leaked hours before the meeting to Youm7. The paper reported the news on its website at 3.44 pm on February 3 in a story titled, “A shocker: a national list for elections, without Ganzouri, announced tomorrow.” This effectively functioned as an official, public notice relieving Ganzouri of his duties. The day after the meeting at General Intelligence, on February 4, a press conference was held to unveil the FLE list at the Sonesta Hotel, attended by the participants in the meeting. Later that same week, the list makers convened a second press conference at the Marriott Hotel, at which they released the names of another batch of candidates on the list. Abdel Azim wrote in his statement, “… and then the Marriott Hotel. I can’t forget when the names were given to Seif al-Yazal on the telephone by an intelligence official, a young man who attended all the meetings. We were hearing these names for the first time then, in plain view of everyone at the posh dinner!” Some of those present at the Marriott conference said that the officer to whom Abdel Azim referred was none other than Selim. Although Selim was tasked with daily coordination matters, Shaaban continued to play a role as well, as revealed by a young man from Upper Egypt in an interview with Mada Masr. The young man said he was one of the names proposed for the FLE list, as a representative for one of the participating coalitions. “On the same day as the Marriott conference [February 8], Shaaban called me and told me, We know you’re a good lad and you love the country, but it’s not going to work out you being on the list. But I promise you, you’ll stand as an individual candidate and we’ll make sure you win,” he said. Neither Shaaban nor Selim responded to several requests for comment from Mada Masr. “The truth is you came to your seats as a result of parliamentary elections held in a secure climate and an atmosphere of transparency, to which the entire world attests. The results of these elections are a manifest expression of the will of the great Egyptian people” — Presidential address to the House of Representatives, February 13, 2016. But statements to the press were not a source of concern for the list makers. In fact, attacks on “Sisi’s list” helped them attract strong candidates, including a significant number of wealthy businessmen. Candidates like Farag Amer, Sahar Talaat Mostafa, Akmal Qurtam, and Mohamed Mostafa Sallab joined the list and bankrolled it, although they could have easily run as independents in their individual constituencies. Meanwhile, the state was racing against the clock to conclude negotiations with all parties and coalitions that had agreed to join the FLE list. It had to settle on a final list of names for the 120 candidates, as well as alternates, while also meeting the constitutional requirements for the composition of lists. The solution came in the form of a ruling from the Supreme Constitutional Court on March 1, 2015, which declared some provisions of the election laws unconstitutional. With the elections postponed, the president’s men were able to breathe more easily and returned to the drawing board. The real sources of concern for the list makers were two other competing blocs: the Egyptian Front coalition, led by Ahmed Shafiq, the head of the National Movement Party, and the Nour Party. Before the deadline for candidacy applications, they both managed to stake candidates for all seats in all four lists’ constituencies. A close advisor to Shafiq who holds a senior position in the National Movement Party, led by the former presidential candidate, spoke with Mada Masr on condition of anonymity. He said that his party and its alliance were ready to make a competitive show in the race for the list seats, but several factors intervened to thwart their aspirations. “We were well represented on Ganzouri’s list,” the advisor said. “I myself was one of the names on the list. But then the state realized it wasn’t ready for elections and the urgency of the Ganzouri meetings faded, so much so that sometimes he’d call the presidency and no one would take his calls. At that point we felt there was a desire to postpone the elections, and that’s what happened.” The postponement “completely did in our coalition,” he added. “The money ran out and we couldn’t find sustained funding for the coming months, unlike the Free Egyptians and Nation’s Future. Their funding didn’t dry up and it was reflected in their election returns.” At the same time, Shafiq’s party took note of the media leaks indicating that the regime did not want to see him return to politics. “The Shorouk campaign in particular was designed to send messages to our candidates and allies that Shafiq was not coming back and would not be allowed to play,” the advisor said, referring to a series of stories published in the privately owned newspaper in May and June 2015 — after the elections were postponed — that quoted unnamed “political” and “sovereign” sources saying that the state was taking action to stop “unacceptable” political movements led by Shafiq from the UAE, where he has lived since mid-2012 in fear of pending prosecution in Egypt on corruption charges. When candidacy applications were again solicited in September 2015, the Nour Party voluntarily withdrew from the Upper Egypt and East Delta constituencies, fronting just two, instead of four, lists, “to avoid provoking them,” as the Salafi leader put it. The party also announced it would reduce the number of candidates it ran for individual constituency seats, although the party leader says they actually maintained the same number of candidates, exploiting the fact that no political party released a final, definitive list of its candidates for individual seats. “But none of that saved us,” he said. “We were subjected to a campaign that could be described at the very least as media annihilation.” The campaign was led by pro-state media, which for weeks in the run-up to elections and throughout the vote reported rumors that the Salafis were on their way to a parliamentary majority and reviving their plan to “Islamize” the state. And so, from February to December 2015, the state apparatus and Sisi’s men were able to co-opt most political parties into the FLE coalition. The two rival forces came away with less than 12 seats each, while several parties and lists decided not to compete in the elections at all. But a comfortable parliamentary majority would require a sizeable number of individual constituency seats to support the list seats. It was decided that this was where the Nation’s Future Party would play the leading role. “The Nation’s Future Party believes wholeheartedly that the security of the nation and the safety of its territory are the first and absolute priorities for every Egyptian” — Official website of the Nation’s Future Party. In December 15, 2013, the Egyptian Opera House hosted the launch of “the Nation’s Future Campaign,” with 1,500 young people, and the goal of “supporting the nation at this historical juncture.” Several senior state officials were in attendance, among them Mostafa Hegazy, political advisor to Interim President Adly Mansour. The chair of the campaign was Mohamed Badran, at the time the president of the Egyptian Student Union, a position he won with the support of civil parties and forces under Morsi’s presidency. 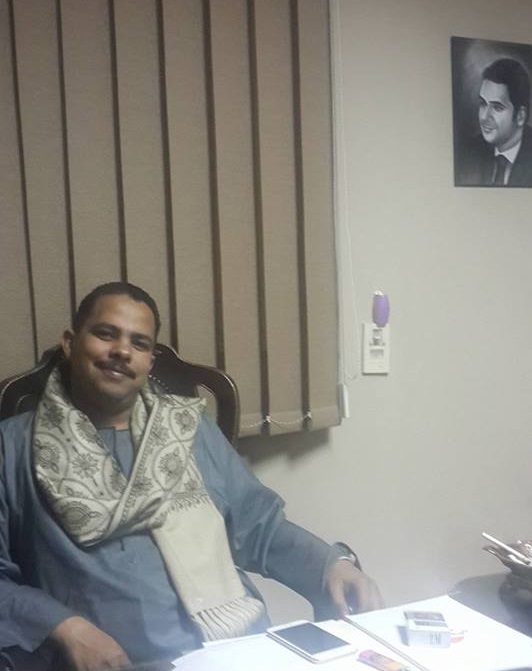 After Morsi was deposed and a new roadmap declared in July 2013, Badran was appointed to the 50-member constituent assembly as a representative of university students. On the sidelines of the constitutional assembly, political advisor Hegazy called for the creation of a youth commission, to function as an adjunct to the executive and allow youth voices to be heard. To this end, he invited representatives of youth movements to meetings at Ettehadiya Presidential Palace, Badran among them. People close to Badran think these meetings allowed the state apparatus to check out the taciturn young man, test his tractability and the possibility of using him as a youth symbol that could be groomed for a future political role. As the constituent assembly completed its task, security officials — among them, yet again, Shaaban — decided they needed “a youth entity to support the president,” according to Abdel Azim’s description, although at this time Sisi had not yet declared his intention to resign as defense minister and run for president. One of the founders of the Nation’s Future Campaign was the president of the student union in a provincial university. 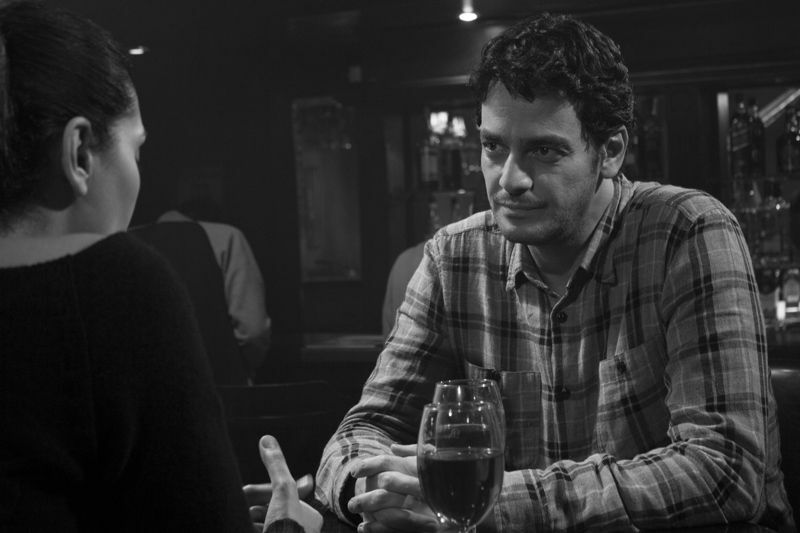 He grew close to Badran, who relied on his support in the national student union elections. In an interview with Mada Masr, on condition of anonymity for himself and his home governorate, the student related compelling details about the internal workings of the campaign that clearly demonstrate its ties to the state and state security officials from the moment of its inception. The source said that the idea of a youth commission began to fade after a few meetings, and then disappeared completely. In its stead, a proposal for an unofficial youth campaign began to take shape. The reason for the shift, the source later revealed, was that new state officials realized that an official commission would be subject to state regulation and budgetary oversight — unlike an unofficial campaign, which would face no legal or regulatory supervision. “After we’d come up with the names of several potential members of the youth commission, Badran told me that the political leadership thought it better to launch a campaign like Tamarod,” the source said. “We got together and suggested names for the campaign, like Egypt’s Youth, the Future in Our Hands, the Future is Ours, and then we discovered that the name of the campaign would be the Nation’s Future, although no one knew who suggested that name.” These meetings were held at the Fairmont Hotel in Heliopolis. One day early in the pro-constitution campaign, Badran asked the student in charge of the governorate to go to the Military Intelligence office in the provincial capital to meet an officer. (Mada Masr has withheld the officer’s name to protect the source’s identity.) When the local activist showed up for the appointment and entered the office, he was stunned: “It was the same poor working guy who delivered the money. I found him sitting in a ritzy office wearing a suit. He told me he was the director of the Military Intelligence branch in the governorate.” The activist added that the officer “started to talk to me about the campaign, saying that the plan was to nominate members for the House of Representatives later on. He gave me his number and asked me never to mention the meeting. After that meeting, the money would come to me in check form, signed by Badran and made out to me, delivered by an envoy from Military Intelligence. The officer stopped coming to deliver the money himself.” One of the checks, a copy of which the source has kept, was received on the eve of the referendum on the Constitution, in January 2014; drawn from the Egyptian National Bank, the check was for LE150,000. The student campaign official in the governorate was at times tasked with organizing marches or demonstrations in support of the military or police or condemning terrorism. “I’d get LE15,000 or 20,000 from the same officer to organize each march,” he said. “The governorate would send us young men from youth centers and the Ministry of Youth and Sport to take part, and each one would get LE100 for the march.” Members of Nation’s Future who proved their worth were also promised exemptions from compulsory military service after they completed their university studies. A different student union leader in a provincial university told Mada Masr that when he went to the military complex to complete his conscription papers, he asked for a particular officer by name, at Badran’s advice. The officer met him and gave him a one-year deferment. He later received a full exemption from service. The campaign did not have volunteers in the conventional sense. The student coordinator says the office he headed in his governorate was staffed by civil servants, who were given leave to work in the campaign headquarters under various bureaucratic designations. 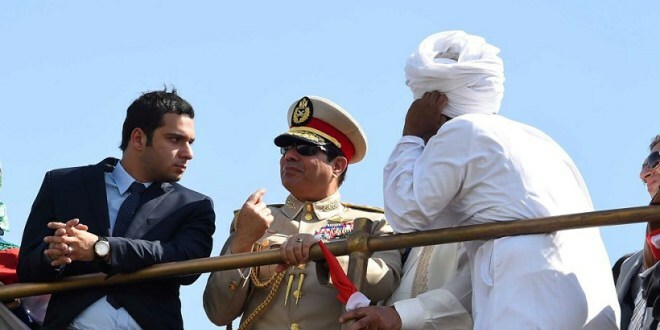 The next sign of the state’s patronage of Badran came later that month, in August, when journalist Ahmed Refaat wrote an article for the weekly issue of Al-Sabbah headlined, “How to become a child of the president in nine steps.” In the article, he criticized Badran’s rapid rise that positioned him next to Sisi during the Suez Canal ceremony. Workers at the Al-Ahram printing house refused to print the issue after an unknown security body intervened. The paper was forced to remove the offending article, and the issue hit the streets late. With this, the message was sent to everyone that Badran was above criticism. In addition to official patronage and financing, most political observers and competitors believe the party would not have met with such astounding success — it won 53 seats in the parliament, outperforming established parties like the Wafd and Nour—were it not for Ashraf Rashad, the party’s secretary-general, who later became the head of the party’s parliamentary bloc (Badran was not eligible to run because he wasn’t old enough for candidacy.) Rashad is also now the party’s acting president after Badran’s sudden departure from the scene, ostensibly to complete his university studies abroad. Like Badran, Rashad was a member of the Egyptian Social Democratic Party in his home province of Qena, before announcing his resignation after June 30, 2013. But the ties between the two men go back to before the revolution, when Rashad, too, was the head of the student union at Assiut University in 2010. He promoted Badran after the revolution and was a major prop in the latter’s race for president of the national Egyptian Student Union. Rashad was a founder of the Nation’s Future Campaign before becoming a founding member of the party and running its first campaign. Along with its generous funding and official support, the party’s electoral success is largely due to its selection of candidates, who already possessed an advantage in their districts, either due to previous leadership positions in the dissolved NDP, ties to major political families, or the financial ability to fund their own campaigns. 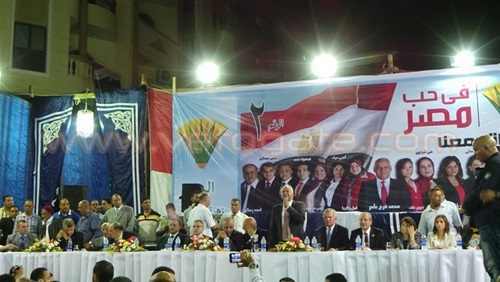 Although the party platform boasted that it is “the first youth party in Egypt, with 120,000 youth members across the republic, nearly 100 offices in all of Egypt’s governorates, and candidates for nearly a quarter of the seats in the House of Representatives,” a recent study found that 60 percent of the party’s candidates in individual constituencies were over the age of 35 and 25 percent were over 50. Mada Masr recently met with Rashad in the party’s upscale office in Heliopolis — the same multistory villa that served as the Nation’s Future Campaign headquarters before the creation of the party. The villa’s garden is strung with large photos and posters of Sisi, while party members refer respectfully to their acting party chair as the bashmohandis, the master engineer (Rashad graduated from the Faculty of Engineering at Assiut University). Since Rashad became acting head of the party, he has led a campaign to restructure it, replacing leaders of the party’s branches in the provinces with his own people. Three former members who spoke to Mada Masr said they view this as a purge of the pro-Badran leadership. As a result, there have been several mass resignations at the governorate level, in protest, former members say, over the installing of prominent former NDP members at the head of branch offices in most governorates, with the exception of those in Upper Egypt, which already owed their allegiance to Rashad. By the outset of 2015, the mission of the men around the president had become clear: the return of the parliament, dissolved in mid-2012, could be delayed no longer, and while the new government had managed to rearrange the roadmap announced in July 2013 to elect Sisi as president prior to the election of a new parliament, it had failed to ensure the inclusion of provisions in the 2014 Constitution that would concentrate power in the hands of the president and executive and produce a defanged legislative assembly. So, more than a year after the election of the president, parliamentary elections were inescapable. The first such elections in four years, they would need to produce an assembly that posed no challenge to the presidency’s tight grip on the political sphere, although the political landscape had shifted radically in the post-revolution period. The first step was drafting an election law with three major features: it should favor individual candidates over party lists, to ensure a less politicized parliament than its predecessor; it should require so-called closed lists, a winner-take-all system that awards all open seats to the list with the most votes, regardless of the number of votes received by competing lists, in contrast to the proportional system used in the 2012 elections, which guaranteed every list a number of seats proportional to their total votes. Finally, it should create a reliable bloc of pro-president MPs from the list-based seats, which, with the addition of individual constituency MPs loyal to the president, could form a comfortable two-thirds majority of the house, while also preventing any other bloc from winning the one-third of seats needed to block crucial decisions. The Constitution also requires a two-thirds majority of the house to override presidential vetoes, remove the speaker or deputy speakers from their posts, and charge the president with the violation of provisions of the Constitution, high treason, or any other felony and refer him to court, as well as propose a motion of no-confidence in the president, call early elections, and put the proposal to a referendum. In short, the specter of an unruly parliament possessed of such critical powers was a far too risky gamble. The strong showing of General and Military Intelligence on the domestic political scene was a source of internal tension between the security components of Sisi’s administration. As General Intelligence sponsored the FLE list and Military Intelligence fostered the Nation’s Future, the National Security Agency under the Interior Ministry — the third pillar of the country’s political security establishment — felt excluded, vexed even. Before the January revolution, when the National Security Agency was still State Security Services, the sector was the primary architect of the political and parliamentary landscape, responsible for vetting and liaising with parties and MPs, wielding carrots or sticks as needed. In Mada Masr interviews with many political players, it was frequently implied that National Security Agency leaders felt that the turmoil on the current political and parliamentary scene stemmed from the fact that they had been sidelined and replaced by security officials from other agencies with no prior experience in managing elections or running parliaments. The new security players scored many apparent successes, thanks to their exhaustive, coordinated efforts: FLE swept all the list seats, its Support Egypt parliamentary bloc dominated the parliament, and the speakership of the House went to Ali Abdel Aal, an FLE candidate from Upper Egypt and a law professor who oversaw the drafting of election laws after 2013. Yet, the president’s men got something else they did not bargain for: instead of a parliamentary majority, a parliamentary multitude. Scarcely a day passes now without another press story chronicling the failure of state, parliamentary, and establishment leaders to rein in the hundreds of House deputies who were carefully selected, based solely on one criteria — loyalty to the current government — without any consideration for ideological affinity, party discipline, or even mutual interest. As a result, the government has publicly failed in its attempts to secure the position of second deputy speaker or to pass the civil service law, voted down by a majority of deputies, despite concerted pressure on them to fall in line. There’s also a growing sense, voiced publicly by some, that Sisi’s government, formed a few weeks before the election, might not win the confidence of the parliament after presenting its program in late March, unless some ministers are replaced. Leaders of the Support Egypt bloc recently announced that their numbers had shrunk from 400 to 250 deputies, after some MPs were expelled for violating directives and others resigned. Politicians and deputies expect the bloc’s numbers to drop further still. Two members of the current parliament told Mada Masr, on condition of anonymity, that the turf wars between the three main security agencies are not unrelated to this so-far disappointing performance. One parliamentarian said that deputies simply wait for MP Abdel Rahim Ali to address the assembly if they want to know the current disposition of the National Security Agency — a disposition that is usually at odds with that of Sameh Seif al-Yazal and Osama Heikal, who channel the views of General Intelligence, said the deputy. He said the tension is also apparent in the media standoff between Al-Bawaba, owned by Abdel Rahim Ali, and Youm7, which is closely linked to intelligence agencies. Similarly, the youth leader from the Upper Egyptian governorate, who was later dropped from the FLE list, told Mada Masr that every time he returned from a meeting about the list in Cairo, he would receive a call from the National Security Agency inspector in his governorate: “Every call, the same thing — What’s the news? No new developments? He’d call just to learn the latest news with the list. It was clear they weren’t talking to each other,” he said with amazement. These latent interagency conflicts will likely take a new turn in coming months as the date of the municipal elections approaches — the first since the January revolution — which will end with the election of some 55,000 local leaders across the nation. Some former members of the Nation’s Future Party told Mada Masr that they have already been contacted by an entity known as the Egyptian Youth Front, which is backed by the National Security Agency as an alternative to the Nation’s Future. It is apparently hoped that the front can win enough local seats to enable the National Security Agency to reclaim some of its influence over the political landscape. Why is Sisi afraid of the Constitution and parliament?